The pride of any great knight is their mighty war steed. League of Angels II, the epic free to play browser MMORPG, is excited to introduce a brand new mount, Divine Steed! This majestic horse, with it’s shining golden armor and angelic aura, is definitely a mount fit for a Champion of the light. One look at this mount and onlookers will know of the great deeds of its rider. Gallop into the legends of Sapphire with Divine Steed! 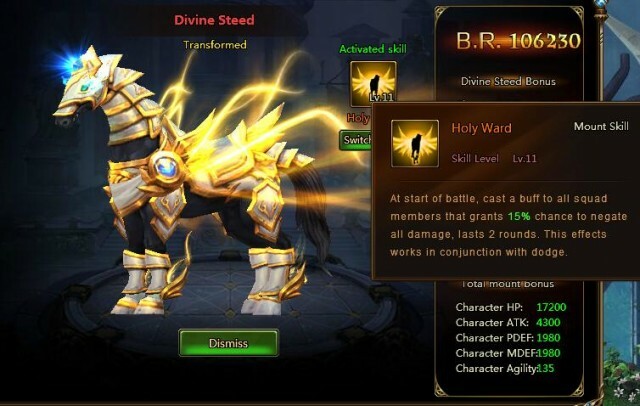 Divine Steed’s unique skill, Holy Ward, provides powerful protection for your entire squad. It’s effect isn’t like any other skill, and is specifically designed to stop the most powerful attacks. At start of battle, cast a buff to all squad members that grants 15% chance to negate all damage, lasts 2 rounds. At the same time Divine Steed will also greatly improve your squad’s HP, attack, and defenses in battle. Be sure to participate in the new X-Server Wheel on August 27th and 28th if you want to get your very own Divine Steed! A ton of other great rewards can also be earned, so don’t miss out on this great opportunity.